You’d have to pay me to want to get into printing my own work. It’s the same ever-evolving tech as any computer, except now you’re dealing with finite & disposible goods; paper, ink, test paper, test ink, wasted ink, paper jams, paper in the wrong side, nozzle checks, colour calibration, more test prints, a bajillion different papers… Proprietary ink to paper bondings that adhere only with a drop of magical unicorn blood – I’m just not interested in those frustrations. That said, I do LOVE to see my work in print. I tend to leave the “how” to professionals, often with CanvasPop or other local experts. I think it’s important to see your own work in print, it forces you to make a selection, truly helps you visualize a layout, or a portfolio, or just shows off that image, proudly to everyone you know – otherwise where does it live? A file system in your computer? No – you have to have an end goal for the work. He takes his time with his readers, since it’s such a nerve racking journey, starting where one should : choice of printers. Laying out the options, and best case scenarios/what to look for. I already feel like I’m shopping with a friend, which is a good thing, because printing is something you don’t want to get into alone. I will note that, for me, the first 17 pages were a bit *too* N00B, but that’s okay, a lot of people will really have no idea the depths of hell they’re walking into, and they’ll need this step by step to ease the pain which includes simple monitor settings, adjustments in Lightroom, Aperture or Photoshop. And I also want to say that my own experience with my super-simple Epson 835 is that, despite my best efforts, the Printer’s own management actually does make the best choices when printing. Go figure. This is where all the meat of the book is, the stuff that’ll get you making great prints. 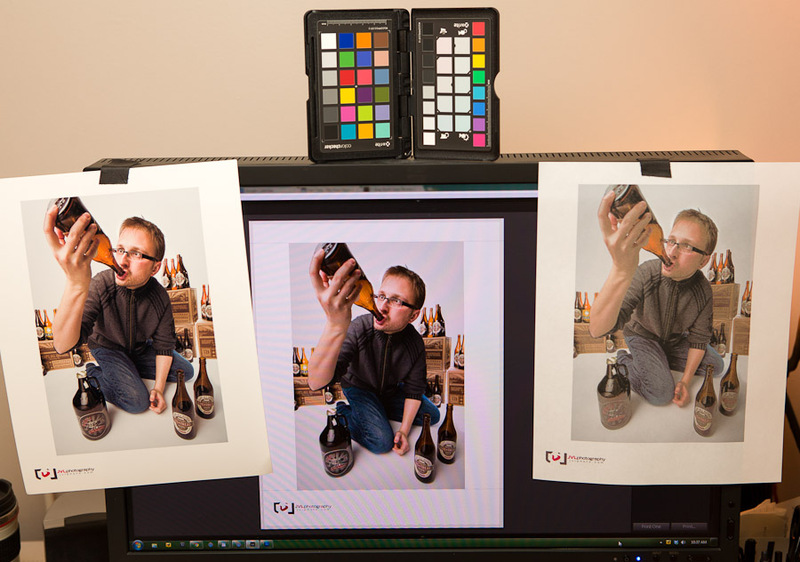 Taking you cleanly through proper monitor calibration – which insn’t particularly difficult but does require the purchase of a calibrator – to soft proofing in Photoshop, and using fine-art papers. The later being, admitedly, the only reason I’d even want to bugger myself with a home-print job. Mr. Baily has a fascinating step-by step on creating gallery images, including the lamination of your prints, and stretching your own canvas. As I’ve mentioned, this is the sort of thing I personally prefer to send out to the pros – leaving me to worry about taking more pictures. While Making the Print is an excellent guide to get anyone who’s interested in doing this work yourself started, I have far too little patience for the tedium involved in “getting it right” and would be just as quick to enact the scene from Office Space as you may be to buy a large format printer. If you’re at all interested in making your own work and getting it to gallery – then this is definitely the book to get you there. You can buy “Making the Print” now at Craft & Vision, and until January 21st use the code “Print4” to get the PDF for only $4! OR use the code PRINT20 to get 20% off when you buy 5+ PDF eBooks from the Craft & Vision collection. Posted on Tuesday, January 17th, 2012 at 10:43 am. Filed under: Review	RSS 2.0 feed. Great post but I worry you drink too much.